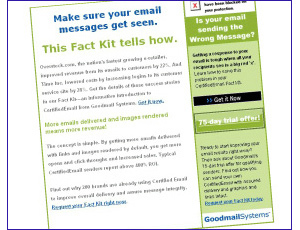 Beasley Direct’s Email Marketing experts heard GoodMail Systems had a great story to tell. Two highly recognizable internet marketers, Overstock.com and Time.com, dramatically improved their deliverability by using the GoodMail solution. Their solution ensured emails arrived with graphics intact — so readers saw what they were meant to see, instead of big red x’s. We leveraged these case histories to create a highly effective campaign. Prospects were invited to download a Fact Kit including the case histories plus more information on the GoodMail Certified Email solution. As a bonus, we gave “hot” leads the chance to sign up for a free trial on the spot. Thus generating immediate business as well as a steady flow of leads. Responders were immediately called by an outsourced telemarketing agency and prequalified before being handed off to the sales group.